SETsquared Bristol is pleased to announce that Kairo have won the ‘Best Elevator Pitch’’ at the 2017 Tech-Xpo event held at PwC offices in Glass Wharf. The start-up was up against ten other SETsquared ventures and won following a digital voting competition among guests in the audience. 15 businesses from the city’s incubator exhibited at the event including AutonoMe, Limber, Nano Simbox and Zoetrope Labs. 11ventures were selected to pitch and get filmed in a fast paced session with only 60 seconds to entice interested delegates and win the ‘Best Elevator Pitch’ accolade. Lisa Matthews, CEO at HellyHolly who have developed Kairo, walked off with the prize. Kairo is the first chat-based assistant for work and home. Kairo takes on all the juggling that goes on in modern families so you can spend more time enjoying life and less time organising it. Tech-Xpo is being supported by VWV, Oracle and Barclays who provide support to tech start-ups across the city and recognise the importance of incubators such as SETsquared Bristol in developing the UK’s high tech industry. Oracle has recently launched its UK Oracle Startup Cloud Accelerator programme in collaboration with the incubator whilst Barclays provides the ‘Banker-in-Residence’ service to SETsquared Bristol members. Law firm VWV, who was sponsoring SETsquared Bristol’s annual showcase event for the 7th consecutive year, has provided a weekly, three hour, “Lawyer-in-Residence” service to SETsquared Bristol ventures since 2009. 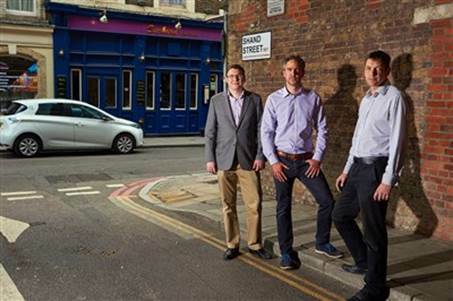 “We are extremely proud of our association with SETsquared and it has been a great year for SETsquared companies, with many of them attracting significant investment, and we were delighted to have been involved in several of those deals. SETsquared and its ventures form the bedrock of our rapidly growing, national, technology sector business, which grew 63% last year. The Tech-Xpo was, once again, a brilliant showcase for Bristol’s tech talent and I was delighted to present Lisa, a very deserving winner, with the VWV “Best Elevator Pitch” trophy”. “Barclays is once again proud to be a sponsor of the Tech-Xpo and we would like to congratulate this year’s outstanding winner. We share SETsquared Bristol’s ambition to support innovative entrepreneurs, and we’ve been impressed with the impact SETsquared has had over recent years. Running any fast-moving, high-growth company takes a substantial investment, from both an emotional and financial perspective, and it’s an investment we want to be fully behind. High growth businesses are a priority for us, they have a hugely positive impact; they create new jobs, new opportunities for investors and they help to galvanise economic growth as a whole. Other companies participating at Tech-Xpo include AutonoMe, Bioinduction, Cerberus Security Labs, CLWB, Duel, FutuHR, Gapsquare, Limber, Lemonpeel Controls, LuJam Security, Music Memory Box by Studio Meineck, Nano Simbox, Test and Verification Solutions, TISCreport, TrustWeave, YellowDog and ZConnect. As with 2016’s event, this year’s Tech-Xpo was filmed with the resulting video launched on YouTube shortly afterwards.